Creating Yard Envy through Bird Houses, Garden Decor, Teak Patio Furniture, and Passionate Landscaping. Indulge in Nature's Gifts in Your Own Backyard, and Make Every Day Beautiful! Bird houses at YardEnvy.com are often considered a bird's delight. While Yard Envy does offer both rustic and recycled bird houses, there is also a huge selection of painted and historical bird houses. Bird lovers can choose from San Francisco Victorian bird houses, cottages, mansions, beach houses, and churches. Not every house is for every bird. 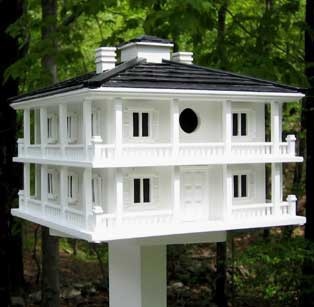 YardEnvy.com provides houses designed specifically for purple martins, wrens, finches, and all sizes of birds. With great resources available to assist in bird identification and education, as well as designs for bird gardens, Yard Envy proves that birds are a serious matter.